The Razorfish spends most of its time hanging vertically in the water column – head pointed downwards – mimicking the lines of seagrass or coral for camouflage. A cousin of the pipefish and seahorse, the Razorfish has a long, tubular nose and thin body. It has a wide distribution across the Indo-Pacific and into the Red Sea, Arabian Gulf, Papua New Guinea and southern Japan. It is normally found in a large school, to depths of 15m. Juveniles can be found along beach edges and hiding amongst urchins and crinoids. Also known as the Grooved Razorfish, Shrimpfish and Sea Snipe, this species is targeted for fishmeal for the aquarium trade. Next time you’re hiding from someone, trying hanging upside down in a tree with your arms and legs as stiff as branches and your fingers like leaves. 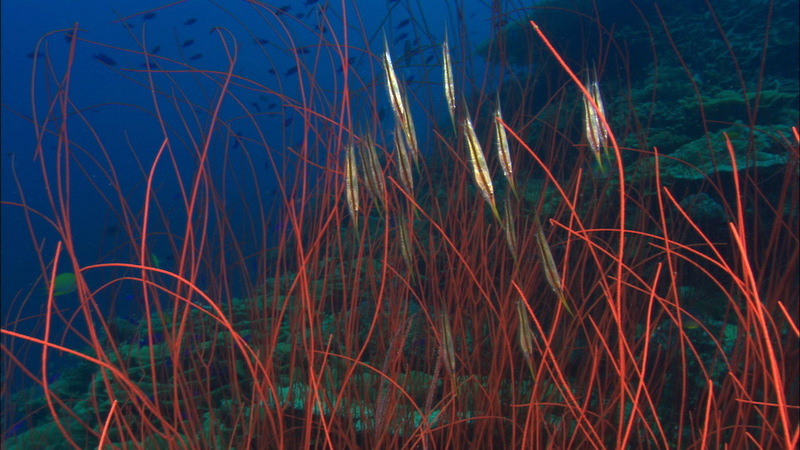 That’s what the Razorfish does to hide from predators …and it works! They’re almost impossible to see.